100% Vienna beef, pickle, tomato, onion, day-glo relish, sport peppers, celery salt and mustard on a poppy seed bun. 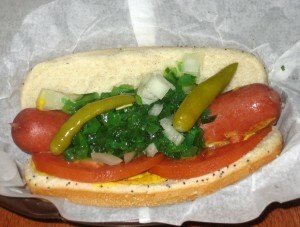 This plump, juicy hot dog is mouth-wateringly good, and the fresh fixins complemented the dog well. Our only complaint is that the casing of the hot dog was slightly tough and chewy. The Chicago Dog is one of Frank’s more simple dogs, but still whet our appetite enough to try some of the more elaborate creations! 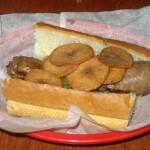 Jerk seasoned chicken and pork sausage with habanero-mango mayo, fried plantain chips, and sweet vinegar apple-cilantro slaw on a baguette. A Jamaican twist on German food – what an innovative concept! The sausage is cooked just right, and the “heat” of the habanero mayo balanced the sweet cilantro slaw perfectly. We did notice that the slaw seemed to be put on the baguette haphazardly because the slaw was only on one or two bites. Since it takes about 6 bites to finish this – it would have been nice to enjoy that flavor more. We ate the delicious banana chips separately, as they didn’t seem to go well with the sausage. Hudson’s sliced brat, curry BBQ sauce, curry powder with a side of baguette. An Indian twist on German food – how could we resist?! The curry sauce is absolutely delicious and original – we’ve never experienced this flavor in a “hot dog”. Beware that the amount of brat is small, but it is spicy and addictive. Pair it with the French bread – yummy! It felt as if we were eating upscale comfort food. Order this one and savor the unique flavors! House baked chocolate chip, pecan, walnut, cranberry and bacon cookie. This cookie is underwhelming and did not live up to its interesting description. 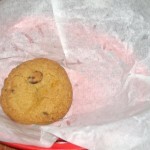 Firstly, it tasted like a slightly stale, chocolate chip cookie – we couldn’t even taste the other flavors. Secondly, the cookie is tiny! We’ll have to try the Banana Fosters or Frankencookie on our next visit. We arrived at Frank on an extremely busy Friday night. The nice hostess asked for our names and said the wait would be about 15 minutes. After waiting 30 minutes, we asked her how much longer…only to find out she forgot to put us on the list. We were displeased but she remedied it by making sure we got the next available table. We were seated on the 2nd floor next to a large-screen TV. Thankfully it was on silent because it was adjacent to our heads. Our waitress was efficient, but not personable at all. To her defense – it was packed inside, but service with a smile goes a long way. Our food came out quickly, and drinks were served in cute Mason jars. 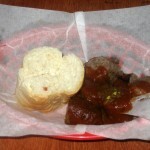 Keep in mind that you can ask for your franks to be grilled instead of boiled, and can request for buns to be toasted. Overall the service was ok, but some polishing here and there would definitely help. Frank is in the former Starlite diner building, but has been renovated into a drafthouse and bodega in one. Its modern touches include high vaulted ceilings, clever beer/hot dog vs wine/caviar décor on the walls, and just a fun Austin vibe all throughout the warehouse. There is bar and table seating, and a small 2nd floor. Since it is located downtown, one would park in a nearby lot or garage. There are a few options on the menu for vegetarians, and they also serve coffee and alcohol. Prices run a little steep, especially since portions are not huge. Frank has a Sunday brunch with a live DJ, and they plan to open a tiny, fully-stocked grocery store in the back of the restaurant. This is a hip and happening hot dog joint – but the creative franks is what will have us coming back! What a great place! The owner is one of the coolest people you’ll meet in Texas and the food, drinks and atmosphere are awesome! They even serve intelligencia coffee which is amazing! The bartender was a deuche but everyone else was really cool. Definitely check it out! I was there for 4 days and ended up there twice!